All Natural Ingredients—I don’t think so! I was watching one of those shows on the cooking channel the other night when I couldn’t sleep. It was one of those shows where they take you to different places and share amazing food. This particular show was Unique Sweets I think. Anyway, they were sharing these wonderful ice creams in incredible flavors. As they were describing the flavors they were priding themselves on using fresh and natural ingredients. I thought, “Oh This is Great!” Ice creams were made to order in the amount purchased (single scoop, double scoop, etc.). How could they make ice cream that quickly for you while you are waiting? Then the truth came out. The camera takes you to the back of the ice cream shop. A customer has just ordered a double scoop of ice cream in a specific flavor. The mixture is poured into a stainless bowl and a whisk begins turning. Okay, are you ready for the way the get the ice cream done so quickly? nitrous oxide is pumped into the liquid as it is mixed freezing it almost immediately! I don’t know about you, but I don’t want nitrous oxide in my ice cream! I have enough problems with my chemical sensitivity without adding something this volatile to my food. Allow me to introduce you to Amy. 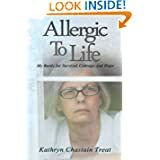 Her story of food allergies and the journey to find out what was making her sick, is an interesting one. Now, I will let Amy tell you for herself. Five minutes. That’s all it took for golf ball-sized hail to destroy the four gorgeous pots of flowers I’d just set out on the patio. In two days our extended family was gathering for a dinner party to celebrate a wedding; I’d have to scurry to find more flowers. What a waste of time and money. What I didn’t realize at the time was that the hail had also completely destroyed our roof along with many windows as well as the siding of our house. I’d be spending the entire summer dealing with the insurance company and contractors. Losing those flowers were small potatoes. Sometimes we focus on the little things and entirely miss the big picture. This is exactly what happened when I started getting sick in my thirties. The doctors focused on each of my symptoms—from vertigo to chronic pain– entirely missing the symptoms were all a part of the same illness. The first doctor said my blood pressure was high and put me on meds. The second one told me my iron was low but brushed it off to a poor diet. Another doctor said the pain in my chest was GERD and prescribed meds. A dietitian told me I was malnourished and gave me a diet to follow. A gastroenterologist gave me meds for IBS. Another gastroenterologist told me to go eat fried foods and if I got sick, I most likely needed my gallbladder removed. A gynecologist told me I needed a total hysterectomy. Each time I got a diagnosis, I let out a sigh of relief. At least it wasn’t cancer. Still, something wasn’t adding up. After all these tests and procedures, followed by a hysterectomy and gall bladder surgery, my symptoms worsened. In fact, I became so exhausted I couldn’t get out of bed. Everything I ate made me run to the bathroom. I couldn’t remember what year it was, or how long I’d been married. Pain shot through my entire body. My legs caved when I walked up the stairs. My eyesight weakened, and I kept developing weird skin lesions. I itched all over. I’d about given up when I saw an advertisement in our local paper for a food allergy blood test. Not one doctor had suggested food might be causing my symptoms—even though I now know reactions to food can cause all the symptoms I experienced. When the blood test came back, I argued with the pharmacy that something must have gone wrong in the lab—I couldn’t possibly be allergic to that many foods! So I went to a board-certified allergist for skin-prick testing. He confirmed I was allergic to myriad foods, including dairy, soy, eggs, corn, wheat, vanilla, nutmeg and asparagus. I’d received negative results for celiac disease years earlier, but a new doctor ran a genetic test and confirmed celiac disease. Turns out I have both genes for celiac disease; either one parent has both genes, like me, or each carries one gene. An endoscopy also revealed I have eosinophilic esophagitis, which explained why food often got stuck on the way down. At first, I found it hard to believe food could make me so sick. I was an adult—adults don’t develop food allergies! But as soon as I started eliminating certain foods, my health improved—immensely! The prescribed painkillers for chronic pain and the antibiotics that followed all those procedures and surgeries in all likelihood contributed to a leaky gut and resulting food allergies and celiac disease. Certainly they didn’t help. Nor did the gluten-filled saltines I kept eating for an upset stomach! I’ve learned a valuable lesson: Pay attention to the details, but look at the big picture. While each doctor had his or her theory for the cause of a symptom, my instinct was that all my symptoms were part of a bigger problem. I’ve since learned celiac disease can have over 300 symptoms! It took some time, but the flowers I thought had been destroyed by the hail eventually grew back. They don’t look quite as pretty as when I brought them home, but they are getting stronger and healthier. Yes, I am a SURVIVOR! I fought the battles and decided that I would not allow myself to be a victim any longer. After years of allowing myself to sink deeper and deeper into depression as a result of my isolation and never-ending medical and legal battles, I had to choose whether I was going to stay in the unhealthy role of victim or begin to live my life despite its many limitations. I chose to SURVIVE! Please join me on day three of my “Spotlight” Author blog tour with Rave Reviews Book Club. Today I am being hosted by Harmony Kent, Harmony Kent Online. Take a moment to visit Harmony’s blog and read my guest post. In March I read a blog post that my friend Karen Ingalls had on her blog outshineovariancancer. The title of the blog post was For No Fear: You Must Know Fear. The title intrigued me and I would have loved to have found this back in the days when I was so fearful; fearful of living another day, fearful that I wouldn’t live another day, fearful of the next reaction, etc. Thank you Karen for sharing such a wonderful post with us. I have been baking scones and freezing them the last few days. I have some organic half and half that needs to be used up; so I am baking. My favorite scone has lemon or orange zest and poppy seeds (sometimes substituted with Chia seeds when there are no poppy seeds). My husband’s favorite scone has chocolate chips and sliced almonds in it (sometimes with a little coconut thrown in for good measure). Thursday I made a batch of my scones and substituted Chia seeds because the organic poppy seeds I had ordered didn’t arrive. I also made a batch of my husband’s scones. I decided to be a little creative and added some almond flour. The recipe calls for 2 cups of flour and I substituted 1/2 cup almond flour for part of the organic wheat flour. They tasted very good. This morning I woke up determined to use the last of my half and half before it went bad. Again I made a batch of my scones using lemon zest (need to order some more orange zest) and Chia seeds. I also decided I would bake another batch of scones for my husband. This is where I became a little over creative. The batch on Thursday with 1/2 cup of almond flour and 1 1/2 cups of organic wheat flour had been good. Why not change things up? I decided to make this batch totally gluten-free. For the 2 cups of flour required in the recipe I used 1 1/2 cups almond flour and 1/2 cup coconut flour (since I add coconut anyway) and a handful of unsulfured coconut. Hmm, I thought. Why not substitute the tablespoon of sugar with coconut sugar (denser and dryer than I thought but I went for it anyway). Well, if I was going to go gluten-free, why not go dairy free? I substituted the half and half for almond milk (left over from my daughter’s visit) and mixed it with the two eggs. So, if I am going dairy free, I should use dairy-free mini chocolate chips. I mixed everything together and patted it out into a circle on parchment paper. I brushed the entire surface with a little of the almond milk/egg mixture and added a few more dairy-free chocolate chips and slivered almonds. Into the oven it went. 25 minutes later, I pulled out the scones with the melted chocolate chips and slivered almonds on top of a golden brown crust. My husband walks in a little while later and takes a slice of his favorite scone right off the baking sheet. He immediately asks what I did different. He says they are grainy and hard to swallow. Uh Oh! I had to taste them for myself. And yes they were a little gritty tasting and kind of stuck to the back of my throat when I swallowed, calling for a quick glass of water to get them down. What went wrong? Should I have balanced the almond flour and coconut flour better? Should I have used coconut syrup instead of coconut sugar? Should I have used more almond milk or added an extra egg? I just don’t know! If any of you who have baked gluten-free have any suggestions, I would love to hear them. Until then, I may not be trying this again for a bit. This was originally posted on February 19, 2013. I have often used the term I would have done it but life got in the way. How many of you have had life get in your way and drastically alter your plans? We can either become a victim or a survivor. I choose to be a survivor! How about you? I was reading a book (one of my mystery books by Tami Hoag). As I was reading, I came upon this sentence: Life is what happens when we’re making other plans. This pretty much sums up my life. I was busy making other plans – starting back to work, my daughters were finishing high school and I was looking forward to summers doing fun things and the possibility of traveling with my husband. Then “life” happened and my life turned upside down. I became ill, work eventually ended and the possibility of traveling suspended. We always thought there would be plenty of time to take those trips. The girls would be grown, we would be closer to retirement, and would have the time and hopefully the income to do those things. Looking back I wish we hadn’t put so many things off until later. Many of those things are now lost but I can focus on what we can still do – day trips to the beach, trips to the mountains, any where we can go in a day. If the day is nice and sunny and I am feeling well, I want to go, go, go. I am sure many of you can say the same thing. We were busy making plans and life suddenly changed all that. Illness struck and changed everything without warning. My words to my daughters is to enjoy life. Make plans but don’t postpone doing things; the things you love and want to do. There is no time like the present because who knows what the future holds.